Roman soldiers to be crucified. head. 18 Then they saluted him and taunted, “Hail! again. Then they led him away to be crucified. myrrh, but he refused it. 24 Then the soldiers nailed him to the cross. o’clock in the morning when they crucified him. thought he was calling for the prophet Elijah. and had cared for him while he was in Galilee. and went to Pilate and asked for Jesus’ body. mother of Joseph saw where Jesus’ body was laid. the angel said, “Don’t be alarmed. 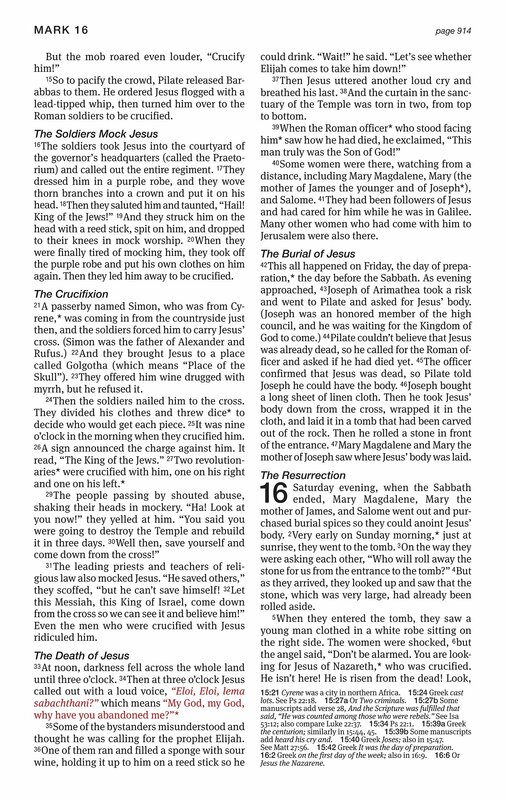 You are looking for Jesus of Nazareth,* who was crucified. add heard his cry and. 15:40 Greek Joses; also in 15:47. See Matt 27:56. 15:42 Greek It was the day of preparation.